The Heptastar 2000 DPM is equipped with 7 LED’s and has an output of 2.000 Lumen. As the power consumption is only 21 Watt, extensive burn times can be obtained without losing power. 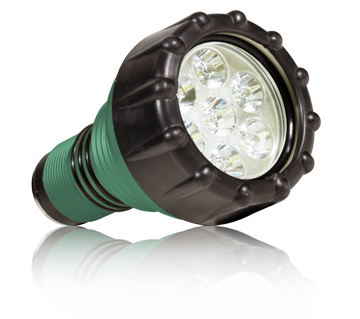 As all LED light heads, the Heptastar 2000 DPM is extremely sturdy and nearly indestructible. The Heptastar 2000 DPM comes in stealth green anodized aluminium. The Heptastar 2000 DPM is equipped with DPM electronics which can automatically adjust the level of illumination, hence providing up to 6 times more burn time with the same battery. This light head runs on batteries ranging from 6 to 18 Volts.